Engineering Ethics Blog: Defense Distributed Versus the States: Losing the Battle but Winning the War? Defense Distributed Versus the States: Losing the Battle but Winning the War? On Wednesday, Jan. 30, a federal judge in Austin threw out a suit filed by the 3D-printed-gun firm Defense Distributed against the attorneys general of Los Angeles, New Jersey, Delaware, Pennsylvania, and for good measure the governors of New York and Pennsylvania as well. Defense Distributed was trying to get the federal court to overrule state and city laws that prohibit the sale of 3D-printed gun plans. It's an interesting study in how the much-abused principle of federalism has been turned backwards by a libertarian-style organization to overrule states' rights—unsuccessfully so far, at least on the surface. First, the backstory. In 2013, a 25-year-old libertarian and University of Texas law student named Cody Wilson made the news by using a 3D printer to print a working gun. Not only did he print and fire the thing, but he made sure the news media knew about it. Not satisfied with just showing it could be done, Wilson forged ahead to found a company called Defense Distributed, which tried to sell plans online so that anybody could print 3D guns out of plastic in the comfort of one's own domicile. The U. S. State Department then intervened, saying this was against export regulations, and because the Internet has no borders, Defense Distributed had to take the plans down. They did so, but sued to get the right to put them back up, and in the summer of 2018, the State Department settled with the company and withdrew its objection. As soon as the company tried to put the plans up again, here came a gang of attorneys general from twelve states where gun control is popular: New York, New Jersey, Delaware, and Pennsylvania, among others. They sued to stop Defense Distributed, and won an injunction in Federal court to stop them. In the meantime, Wilson himself was arrested for sexual assault on a minor, and resigned from the company he founded. But Defense Distributed is still with us, and currently sells inexpensive milling machines that people can use to make guns at home. Milling machines aren't illegal—not yet, anyway. And in the meantime, news reports show that private websites have plenty of 3D-gun plans available, and nobody much is going after them to shut them down. Any time technology advances to a point unanticipated by the legal system, trouble can arise, and that seems to be what's happened here. When guns were considered so hard to make that no legislator bothered to make home gun manufacturing illegal, it was thought sufficient to regulate the sale and manufacture of firearms by large industrial firms. The history of how private ownership of guns in the U. S. has evolved to the present day is much too long to summarize here, but a thumbnail sketch of the current debate is as follows. On one side there are those who hope for an ideal civilization where nobody but a few idle policemen carry firearms, and maybe not even them. Everyone is so enlightened that armed conflict is inconceivable, and anyway, even if somebody did want to start a fight, there's no guns around to use, so nobody gets shot—accidentally or otherwise. These folks see increasing restrictions on private ownership of guns as the right side of history, and view 3D-printed guns as a step backward in our progress toward a gun-free future. On the other side, you have rugged individualists who believe it's every person's right to defend him- or herself with any means necessary. And since there are a lot of bad hombres out there, it's your right to own and carry a gun. If the laws in your locality don't allow you to obtain one legally, then go home, download the plans from Defense Distributed, and make your own. I exaggerate on both sides for clarity, but the libertarian position of minimal government clearly comes down on the side of gun ownership and makership. It's ironic, then, that Defense Distributed finds itself calling on that bete noir of libertarianism, the behemoth called the federal government, to squash the states' rights to suppress gun making at home. But at least it's consistent with the philosophy behind the firm, which is basically that anybody should be able to have a gun, and if you're competent enough to run a 3D printer, you're competent enough to handle a gun. A further likely irony is that in a few years, this whole kerfuffle will probably look as outmoded as when record companies went around in the 1980s trying to get a royalty assessed on blank tape and tape recorders, because they were worried about the revenue they were losing when people copied vinyl records instead of buying new ones. When digital recording came along, and then the Internet, the bomb really went off under the recording industry. And now such efforts look merely quaint. YouTube is now on track to harbor every audio and video recording ever made, copyrighted or otherwise, and the idea of stopping them is like trying to convince a stampeding elephant not to trample your daisies. In other words, the attorneys general may have won this battle, but it looks like in their fight against the spread of digital firearms, they're already losing the war. Whether this is a good thing or not depends on which side you favor in the conflict. Personally, I do not own any firearms and I'm not fond of hunting, but some of the nicest people I know do and are. As for Defense Distributed, without its colorful leader Wilson and in view of the fact that a lot of what it was trying to sell is online already, its days may be numbered. But the time when anybody can 3D print a whole lot of things that other folks don't want them to print is coming fast, and we might as well be ready for it when it gets here. and Wired at https://www.wired.com/story/cody-wilson-3d-printed-guns-resigns-defense-distributed/. An archival New York Times article about the record companies' efforts to extract royalties from the consumer recording business in 1985 is at https://www.nytimes.com/1985/11/21/arts/issue-and-debate-royalties-on-recorders-and-blank-audio-tapes.html. I first blogged about Cody Wilson and his guns on May 13, 2013 at http://engineeringethicsblog.blogspot.com/2013/05/printing-guns.html. 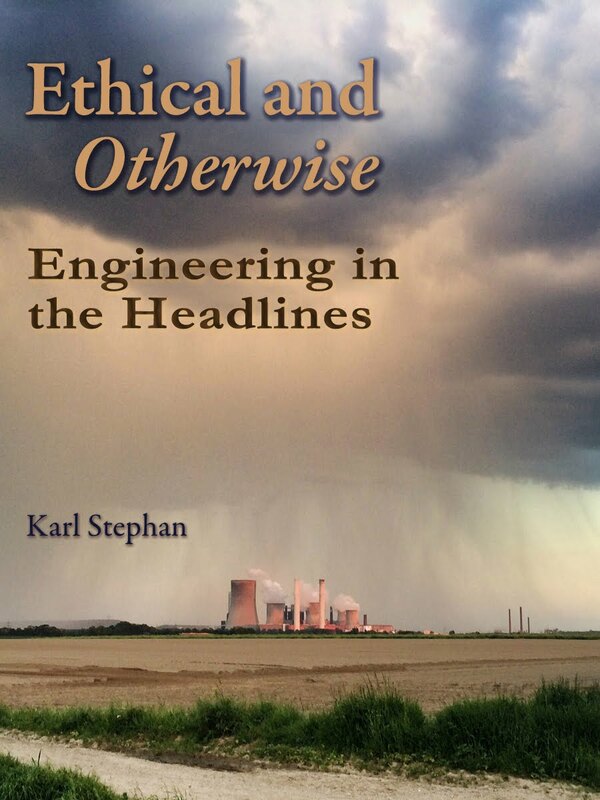 Ethical and Otherwise: Engineering In the Headlines is a collection of over 40 of the most popular blog posts selected from nearly ten years of Karl Stephan’s engineering ethics blog. Bridge collapses, airplane crashes, train wrecks, explosions—the most widely read blog posts are all here, from the truth about why the Titanic sank to the latest recall scandal. This ebook is available in both Kindle and iBook formats. 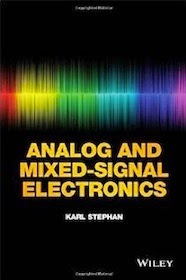 A practical guide to analog and mixed-signal electronics. Covers elementary analog circuits, analog-to-digital and digital-to-analog circuits, high-frequency circuit design, and power electronics. Recommended for EE undergraduates, advanced students, and for those involved in computer engineering, biomedical engineering, computer science, and physics. Publisher: Wiley (2015). See this book on Amazon. Biotech in Agriculture: Blessing or Curse? I have worked in industry and as a consulting engineer. I currently teach college-level engineering courses at Texas State University, San Marcos, Texas.